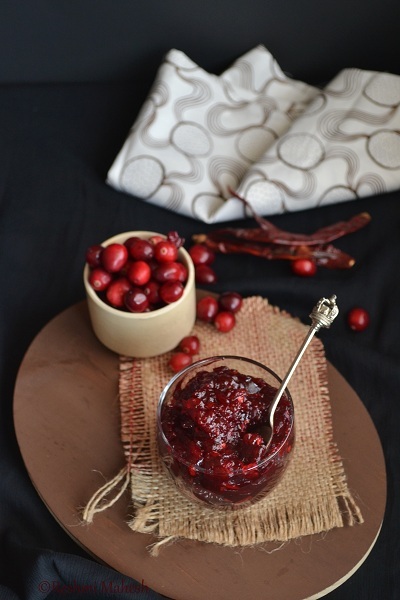 Easy Cook: Cranberry Chutney..My twist..
1. Add water and cranberries in a pan and boil till it pops and breaks. About 4 mins. 2. Mash slightly the popped berries and then add the cumin powder,cloves, salt and chili flakes.Reduce the heat to low. Boil till the water is reduced to 1/4 cup. 3. Now add the brown sugar/jaggery and continue cooking. Add the ginger pieces at this stage. Mix well. 4. Continue cooking for 4 minutes till the mixture turns slightly thick.Turn off heat, cool and store in a dry jar.Have with chips, breads,rice,anything and everything. 1. I din't wanted to cook ginger, so added it in the last step. The ginger had the crunch, still was mixed with the cranberry nicely. 2. Add jaggery/brown sugar by checking for sweetness. Don't add too much. Recommended to add 1 tbsp at a time. Mix and check.The chutney was thick, slightly sweet, tart and spicy. 3. If you want it slightly runny stop cooking when desired stage is attained. 4. With above mentioned quantity I got about the amount of chutney pictured. 5. To make roasted cumin powder : Heat a pan and add 2 tsp of cumin to it. Roast it on medium heat till nice aroma spreads. Now crush this using a mortar and pestle to fine powder. Very interesting chutney.. So colorful and yum!! Love that spoon.. As usual amazing clicks.. I wish we got things like cranberries over here. Love your twist on the chutney. Should suit our tastes better! 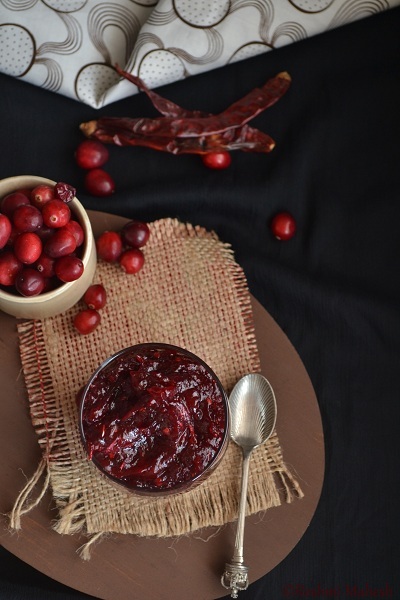 yummy and perfect chutney! 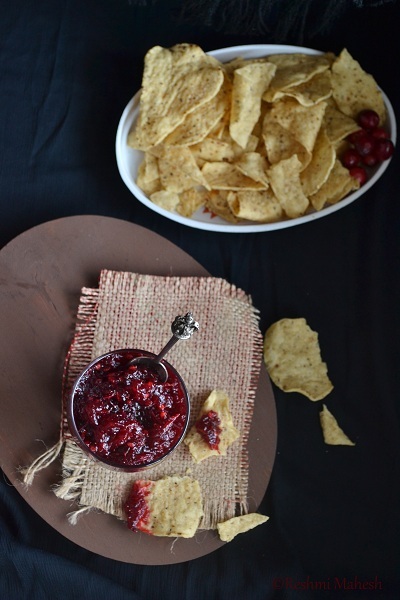 can we do this with frozen cranberry? 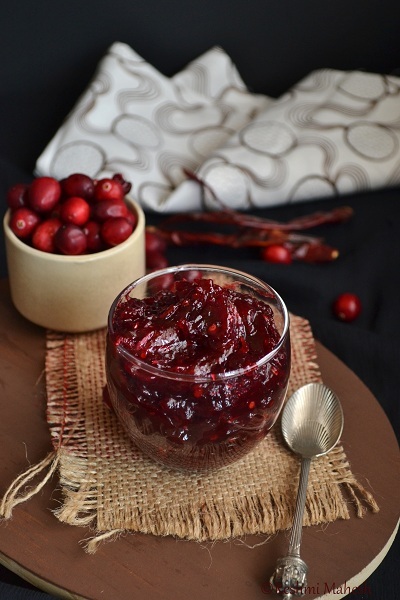 Lip smacking chutney..lovely presentation..Think the same ings would do for dried cranberries too? wow reshmi.. lovely clicks and liked the background..
wow!this looks so tempting and delicious.beautiful colour and presentation!! lip smacking and delicious!!! nice pictures!!! Love this sour, sweet, hot and colourful chutney! Absolutely divine. Awesome clicks dear. Wow,super tempting and so colorful..love the clicks. Blogging helped me understand how different and various Indian kitchen is! Your chutney looks very delectable! 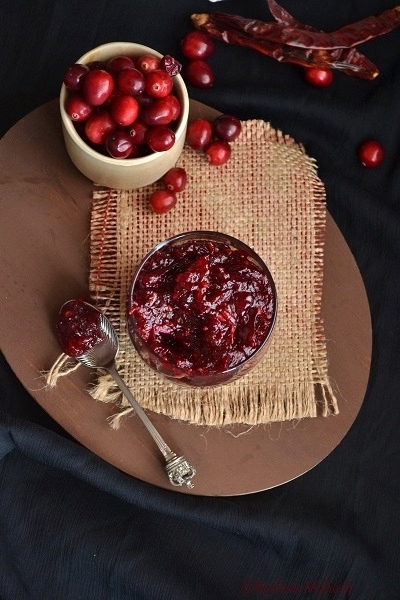 Delicious cranberry chutney. Love your version Reshmi. Now a days.i am becoming fan of ur clicks.love it also the chutney. Ginger flavoured canberry chutney is my fav. looks too delicious dear. As Indians, any chutney will do! And this has an appealing colour. Super catchy and great looking chutney, beautifully done. 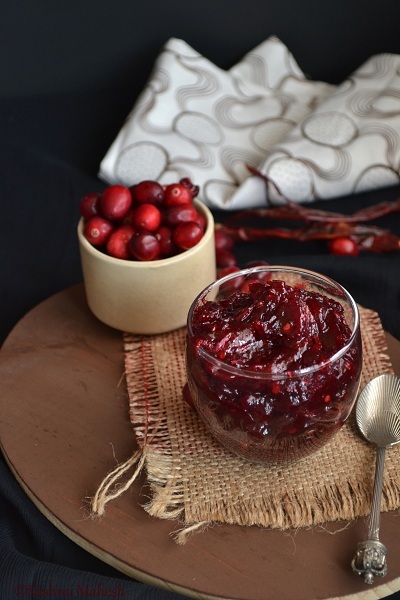 Quite honestly I would prefer your cranberry chutney to regular sauce for the holidays. Looks amazing! 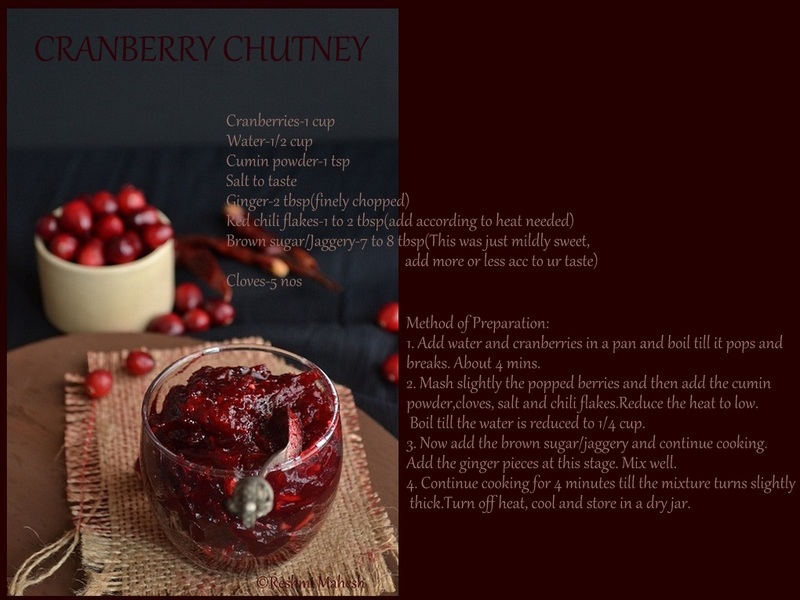 Chutney looks delicious & the mingle of flavors is awesome..
@Veena and Prathima: You can use dried as well as frozen cranberries. Very pretty n colorful chutney...nice clicks.. Your pictures are so tempting, Reshmi! This chutney sounds & looks great! 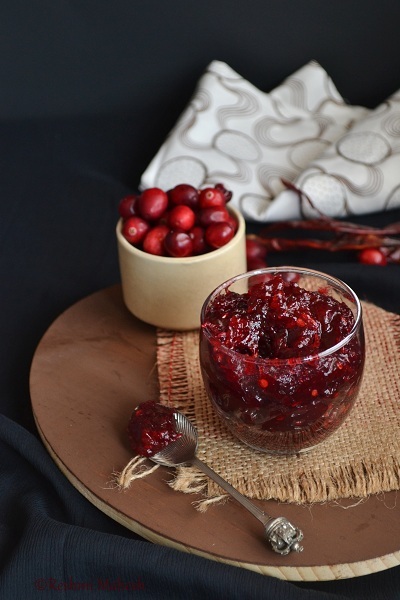 when I make cranberry sauce I usually add sweet spices like cinnamon and cloves - I never did it with savory spices - the chile must add a nice kick to it - but since cranberries are so tart, I think I would need more sugar/jaggery. Will def. add the chile to it next time I make it. Looks awesome! 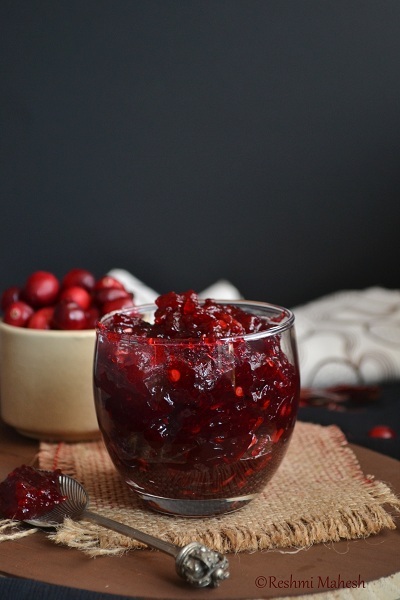 I've been lately seeing lots of cranberry recipes going around, and I'm so inspired in making them... especially I can't wait to make this one! Looks too good.